With the amnesty in the 1980’s, inhabitants get property documents giving them the right to use public lands on which they settled. 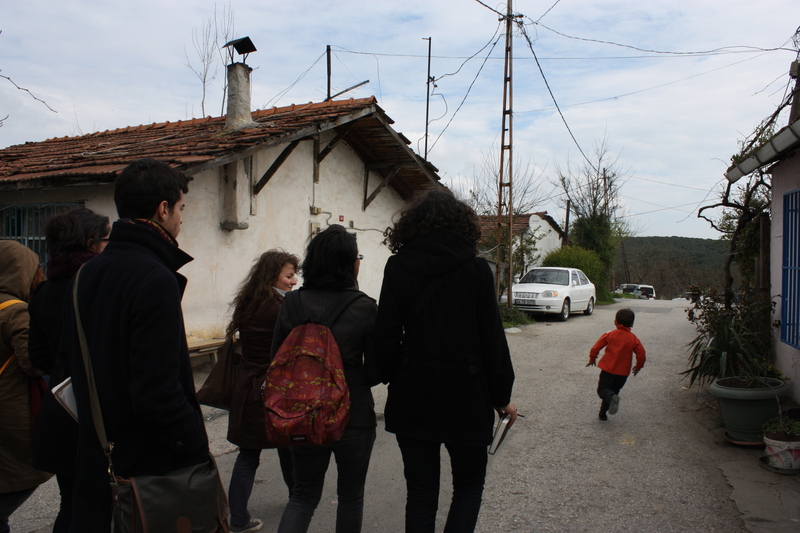 Some of them took advantage of the situation to add stories to their building, turning gecekondus into apartkondus. These floors can be rented to new comers, who are not officially recognized, so, much more vulnerable when confronted to Urban Transformation Projects (UTP’s) led by the states or private developers. This situation makes sometimes difficult the distinction between the informal apartkondus and legal districts. In the UTP’s, there are ‘winners’ and ‘losers’. Indeed, in Arıcılar, those who owned their building could negotiate with contractor to leave the place (even if officially, they have nothing to sell) whereas tenants were displaced without indemnity. 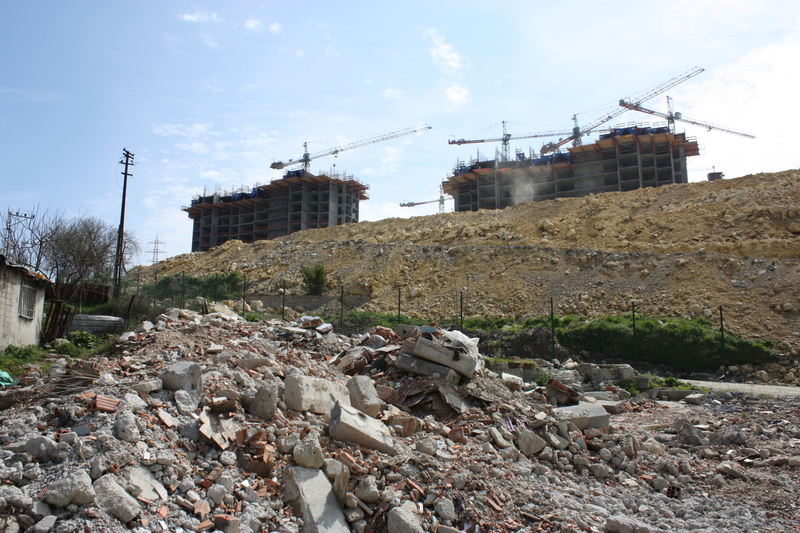 On the contrary, people resisted in Ayazma against the “regeneration” project. Everybody get something from the construction company. Some of those who had official documents obtained 250LT/m² to leave their home. This can be a reason why there are new stories on building that will be destroyed anyway (it may cost more to sell it afterwards). Other inhabitants, mostly among the tenants, get an apartment in the TOKI new housings, far away from Ayazma and Istanbul. Most of the time, the apartments are on the ground floor or in the basement, implying a completely different way of life, so they come back regularly to Ayazma to use their stone baker’s oven and to enjoy the environment. At last, six families are still in Ayazma, struggling for another alternative, and endeavor to defend themselves via legal action. They need to trust a lawyer, and it would cost about 20% of their income. They are afraid and don’t trust easily the lawyers, because they can, at last, serve the opposite interest (and this already happened). The new urbanization takes several forms. 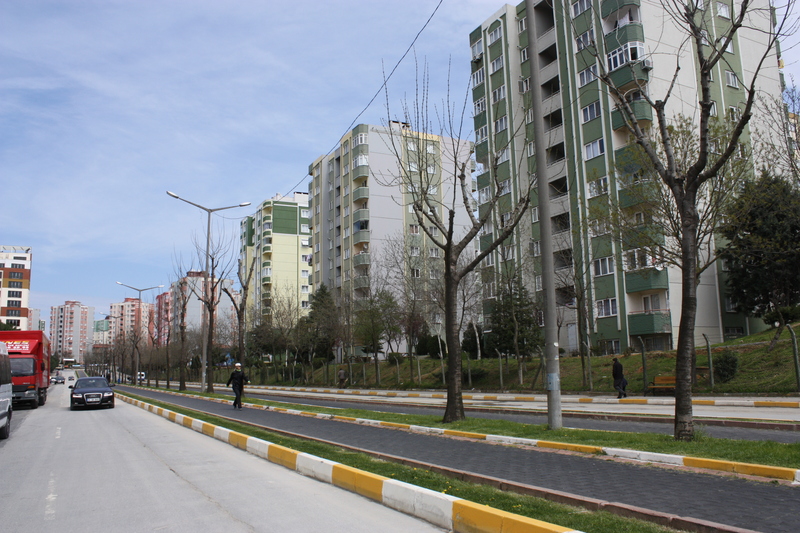 Başakşehir is a satellite town built first by Kiptaş a company linked to the Metropolitan municipality of Istanbul. The next steps of the construction have been managed by TOKI, and a part of it, by the army. 35 000 housing units are destinated to a muslim conservative “bourgeoisie”. It is supposed to be a model of segregating public space (separating men from women). Kayabaşı is an example of another form of Istanbul’s new urbanization. A cluster of 10 to 15 stories towers, 65 000 apartments still under construction supposed to be a city to welcome displaced population from the historic peninsula. The TOKI towers have been placed in the landscape without planned public spaces. At last, all these urban patterns, from the informal gecekondu to the gated community, different lifestyle are opposed. In term of public space, we had the occasion to see the “traditional” market place adjoining a new mall, archetype of the current urbanization. After the visit we went to the local of Dayanışmacı Atölye (hosted by the association Bir Umut) in Taksim to prepare the workshop and especially the fieldwork in Kazım Karabekır. In the evening, we had a work meeting at Dayanışmacı Atölye (DA) office, where one of the DA members explained what kind of work they do, what are their reasons and their purposes. The association has been created seven years ago but had another name. The more significant DA’s work was about Sulukule, a rom (gipsy) district localized in the historical peninsula. The members organized a workshop gathering a lot of volunteers, especially students and academics from Turkey and from abroad (from the London School of Economics for instance). Then, someone commented the Istanbul eviction map that was in the background, produced by volonteers of the association (and UN-Habitat). This accurate map is one way to show the impact of UTP’s on the global urban pattern. According to a DA member, the government judges the poor and working population useless now because there are no industries to work in anymore, and they cannot match to the global vision of the future Istanbul foresaw by the Metropolitan Municipality and the Central government. The prime minister even proposed to subsidize people’s travel back to their villages or small town in the countryside. After this introduction, Dalila made a brief summary about the public meeting organized by the neighbourhood associations’ platform of Sarıyer on Saturday, 16 at the Mustafa Kemal Center in Karanfılköy. She describes how the meeting took place. It started with a video showing people interviewed in the gecekondu called Pinar, saying they love their place and don’t want to leave it because they settled there a long time ago and built it. The short film showed an intimate and “emotional” image of the gecekondu. Assisting the meeting, in the amphitheater, there were groups of about 50 peoples for each Sariyer’s districts (they did not mingle). These samples were quite homogenous: mostly around 45 and 65 year old men, and only a group of 50/65 year old women wearing “traditional” clothes. 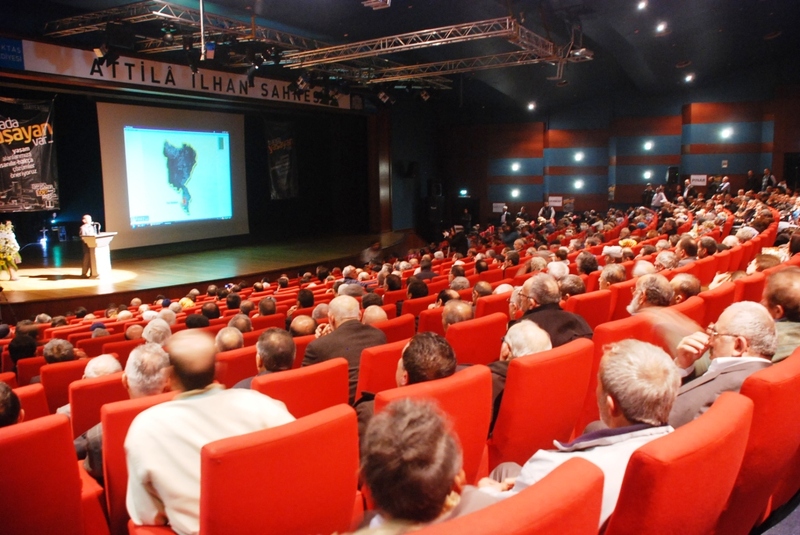 Each district were successively presented through a power point projection, giving informations such as population, localization, date of settlement, main social issues… Derbent neighborhood has been particularly noisy and expressive, shouting “Sariyer is us and will be us” when Sariyer mayor entered the room, which shows an ambiguous relationship with the local municipality, that is blamed to act against gecekondus inhabitants interest sometimes. After every projection, every neighborhood association representative or president intervened on the stage to expose his neighborhood’s expectations and complains. Globally, they insisted on the fact they are not squatters and have legitimacy to live the place, they built their Gecekondu, without the state opposition. In the contrary, the government through the municipality supported their settlement implementing electricity, water network, pavements and streets, amnesties. The meeting was an exceptional representation, taking place whereas legislative elections will happen in June. Potential candidates were present, and the presentation aimed at putting pressure on them, showing they do have a voice and they are strong together. Moreover, everybody, at the beginning of the meeting, stood up, had a one minute silence, and then, sang the national anthem. An interpretation of such a scene can be the will to appear as responsible citizens belonging to the nation, so, respectable, in opposition with all the clichés conveyed by newspapers and other medias.